Hey all! 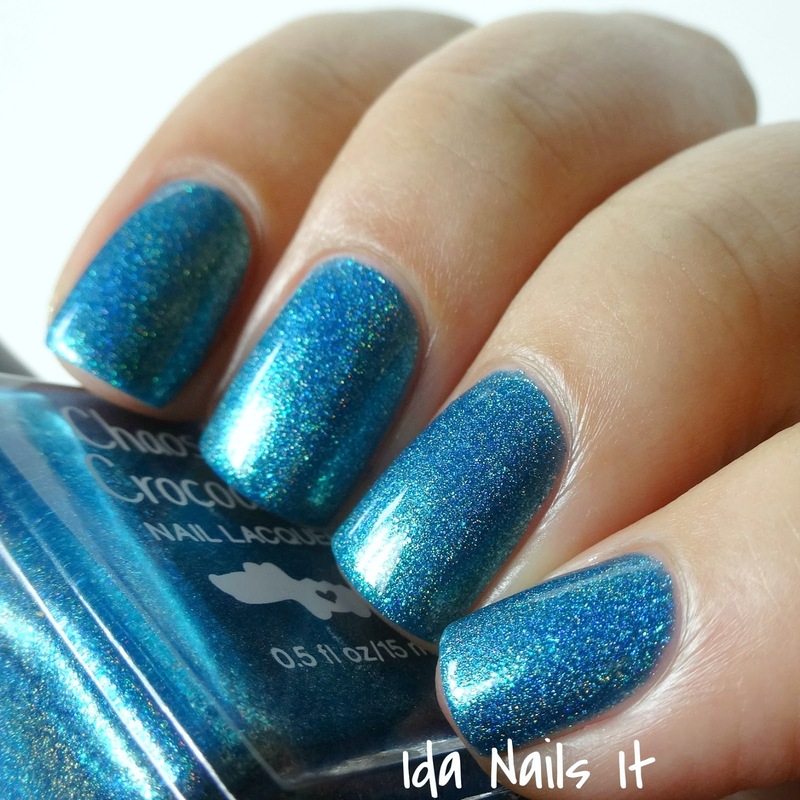 I am excited to share with you some new polishes from Chaos & Crocodiles. 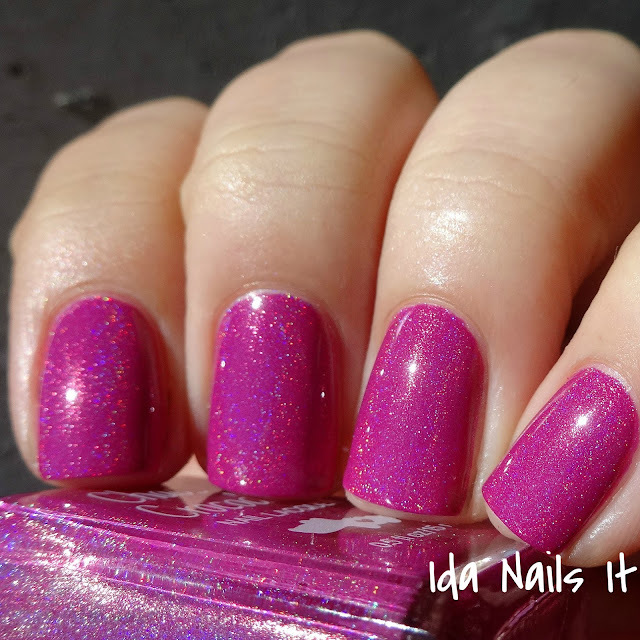 These four polishes make up her upcoming The New Neighbors Mini Collection. 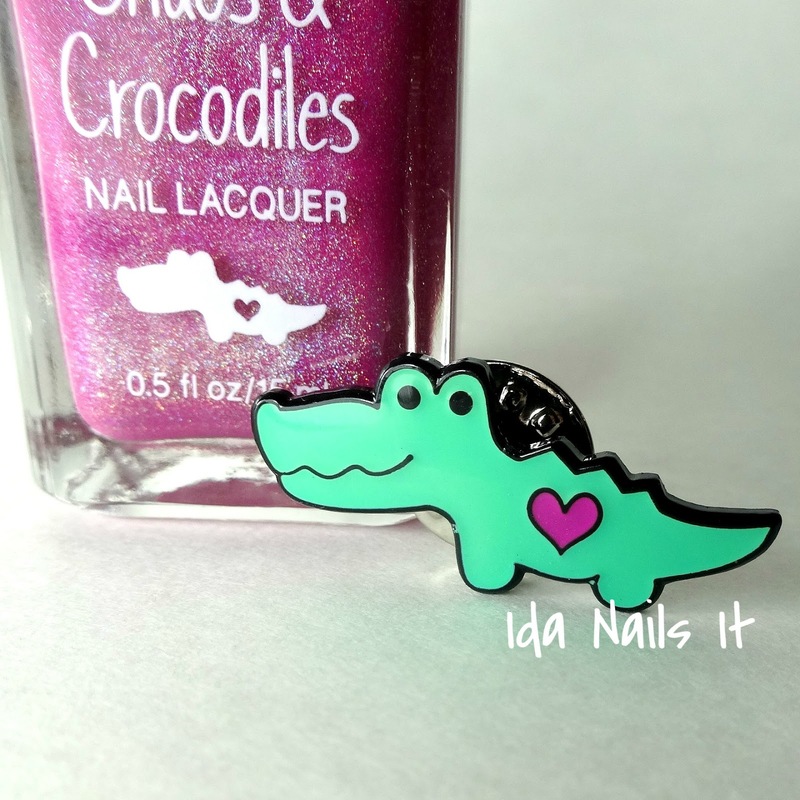 Also included in this release is a new item, a enamel pin of Chaos the Crocodile, the Chaos & Crocodiles mascot, . Look for the New Neighbors Mini Collection to be released this Saturday, April 2nd in Chaos & Crocodiles shop. Specific time will TBA, so follow Chaos & Crocodiles's Facebook or Instagram for that information. 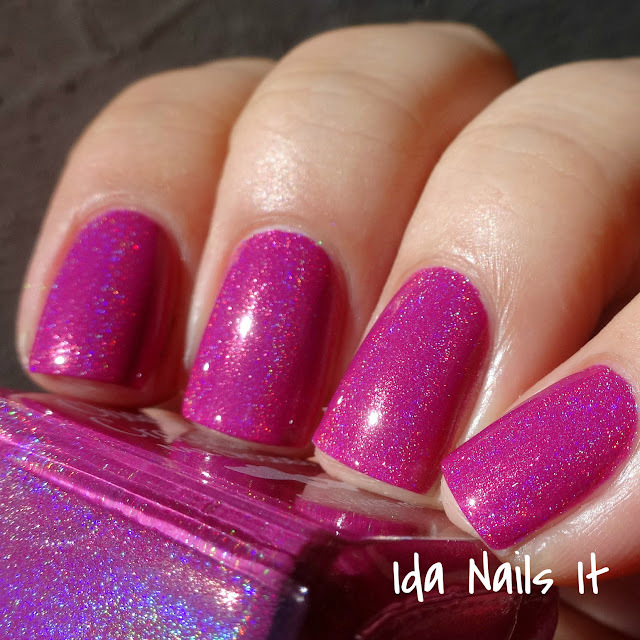 You can purchase the full set of four with the pin or each polish and pin separately. Did you know that maker Sarey creates and designs her branding and her mascots? They are each so cute and I always keep the extras that accompany my orders. Chaos, the little crocodile, is one that is on her logo and now you will be able to carry him along with you in the form of an enamel pin that you can attach to your favorite tote, lapel or for me, it will be on my name-tag. Just a little happiness to brighten your day. 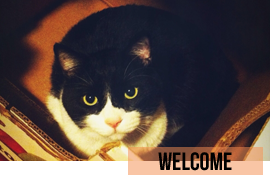 The color of Chaos' heart is the same magenta that is the very appropriately named Cuddles from Chaos, shown below. Sweet as can be, with a saturated pink coloring. Application was lovely, two easy coats for coverage. 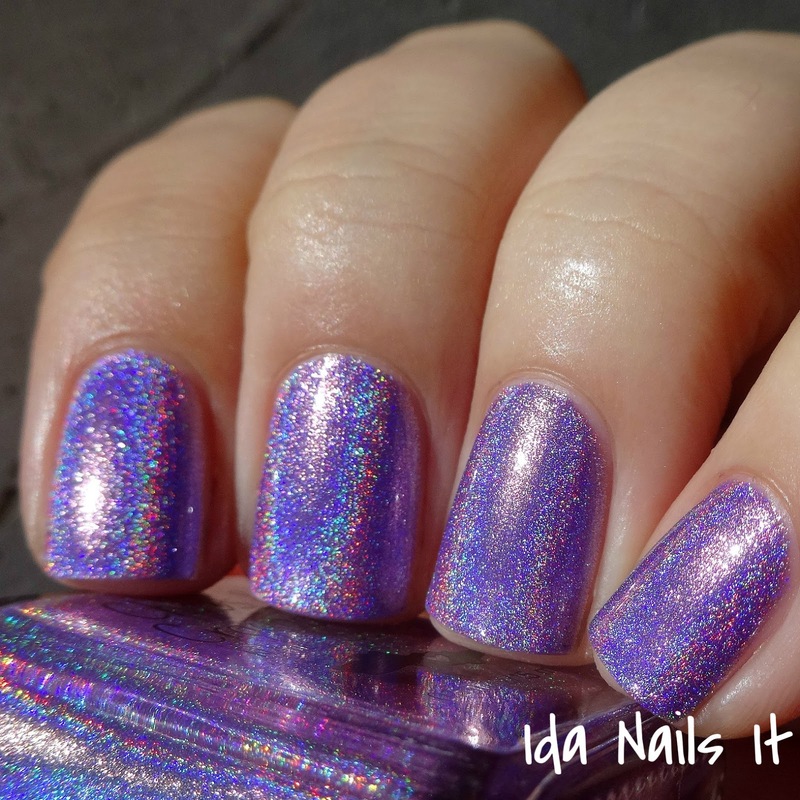 In the sun, the holo flame is a lower density one but it warms the color and adds some sparkle. You guys are going to laugh at me but my favorite of all four polishes is this pretty beige polish. Yes I love bold pinks, but I love just as much cool toned neutrals. And this one is wonderful. 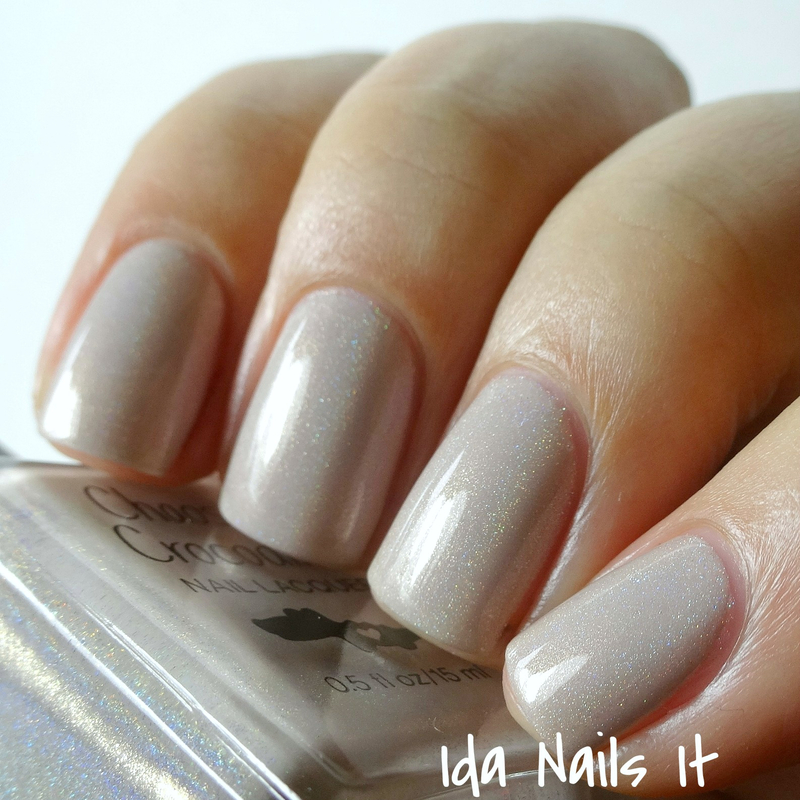 I was expecting to need three with it's lighter coloring and was pleasantly surprised that it was opaque in two coats! Like Cuddles from Chaos, the holo flame is a lower density one. 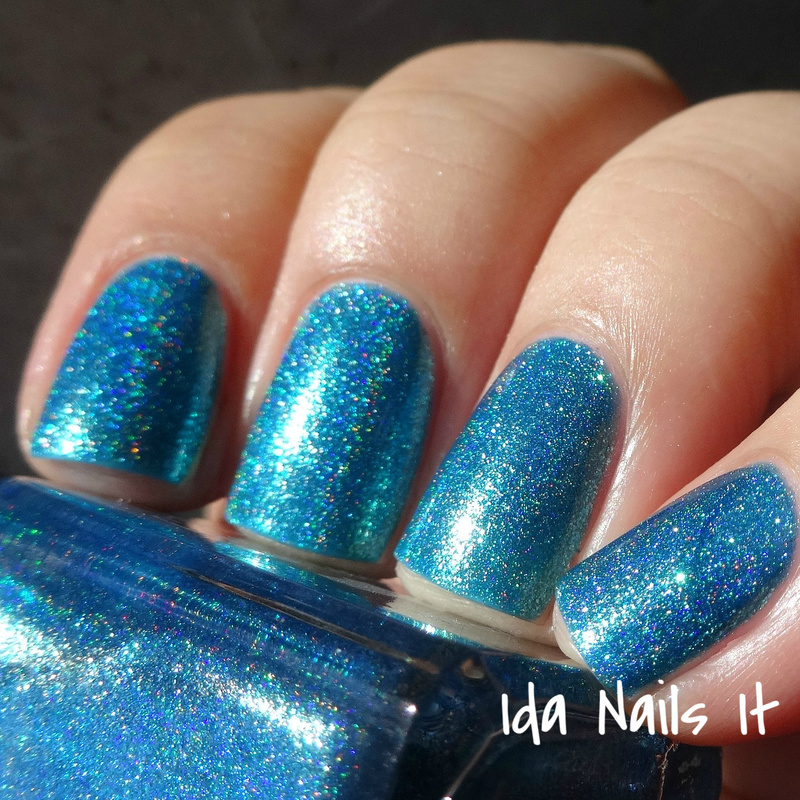 Gorgeous teal blue shimmer in holo form. The shimmer in the polish give it a metallic or mirrored quality that I quite like. It was a bit thicker in formula than the previous two but this was not an issue with application. 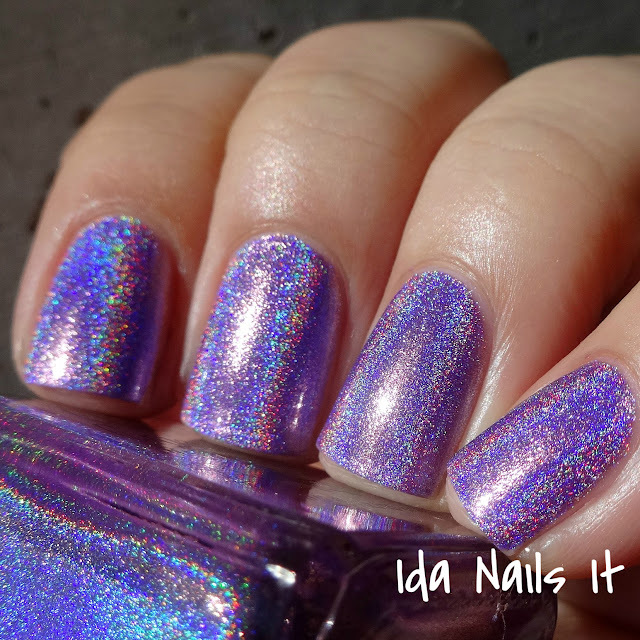 You purple polish lovers will want to snag this one. The coloring is somewhat between lavender and lilac to me, regardless, it sure is pretty. It has crazy bold linear holo flame that I absolutely could not stop staring at. Application was great, two coat and you're done. I am trying to get my nail art on more so hopefully that means more nail art in my blog reviews. We shall see how long that goes lol. When I saw An Alpaca with a Plan and Cuddles from Chaos sitting next to each other on my desk, I thought they NEEDED to be worn together. A simple dotted pattern that is super easy to pull off, with An Alpaca with a Plan as the base, and Cuddles from Chaos dotted on with my trusty dotting tool. 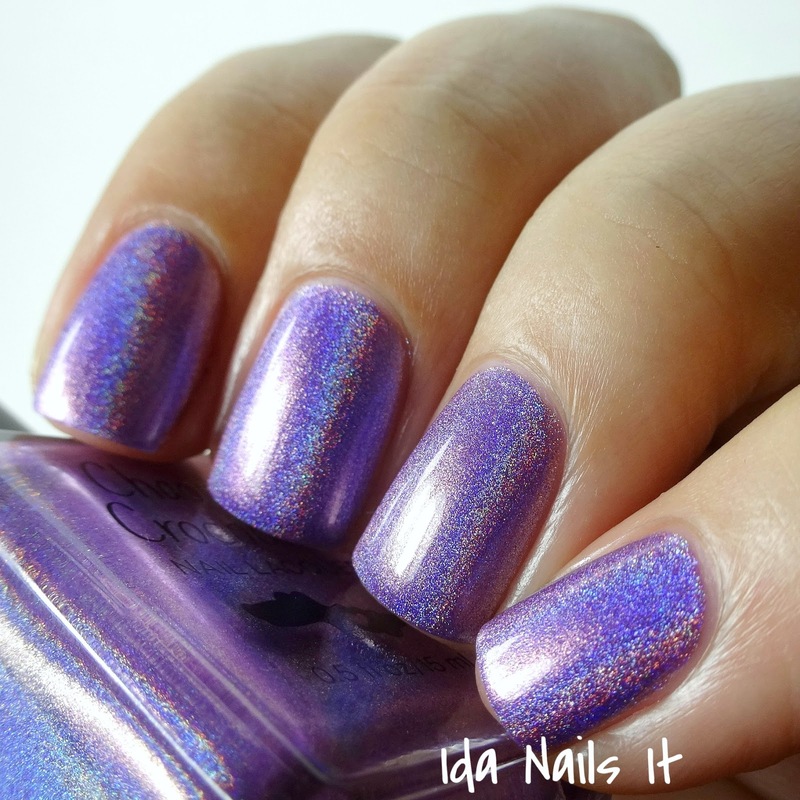 Some gorgeous colors you swatches in this mini collection. Those dots are perfect! Love it! An Alpaca with a Plan is just.. AMAZING. The name, the color, the formula <3. 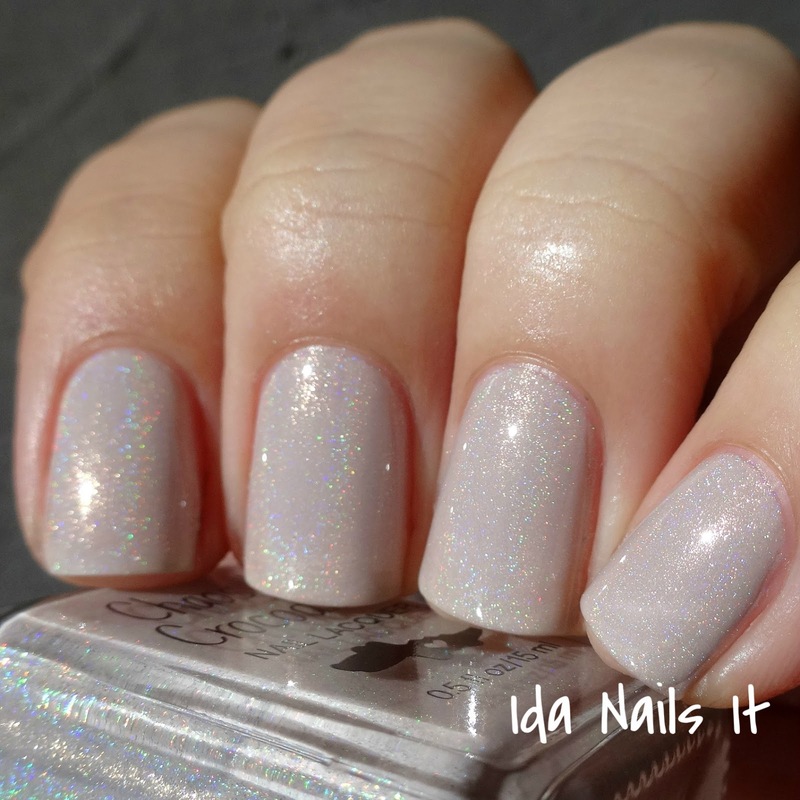 I agree Deborah, it's so a pretty neutral and the name made me lol.